It’s #micasamonday I love the color black! A lot. For the small guest bathroom, I knew black would be the perfect fit! We had the walls paneled and painted a semi gloss. 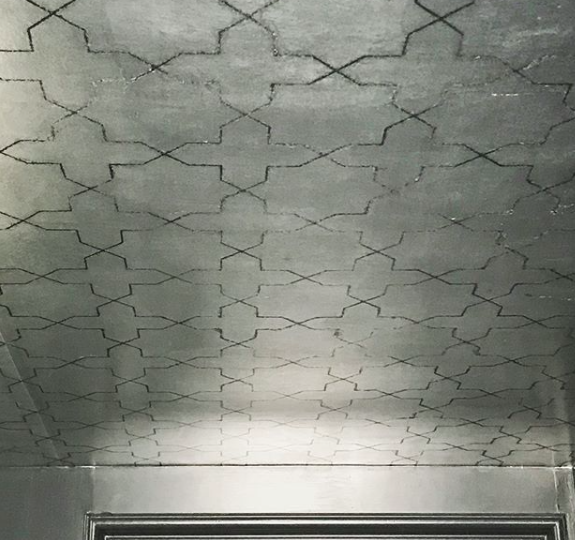 We ordered the @phillipjeffriesltd metallic wallpaper with a Moroccan vibe from @squarefootds and had it installed on the low ceilings. Contrary to what most people think, a dark color helps the walls to recede in a small room, making it feel bigger. This room gets decorated with fresh flowers for every party and cut branches for everyday. The huge mirrored wall with bright sconces make it easy for guest to do a quick primp. 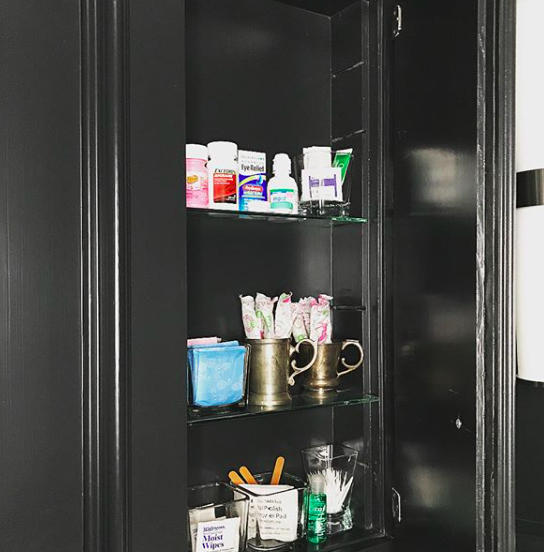 The medicine cabinet is fully stocked with everything a guest might need to get through a party; contact cases & solution, bandaids, pads & tampons, mouthwash & flossing sticks, Pepto Bismol & headache medicine. 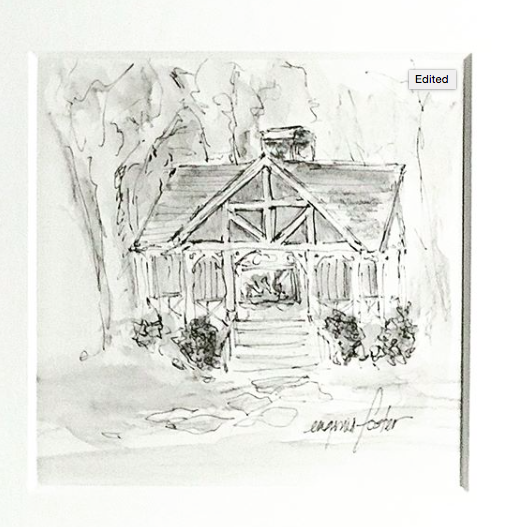 Guest can privately help themselves, yeah those kind of parties🍾 We bought the drawing when we stayed at @blackberryfarm for our 31st wedding anniversary. A year prior, I had lost my wedding ring but refused to buy another because I was holding on hope that it would turn up. While having dinner, at the outdoor dining cabin in the drawing, my hubby surprised me with a gorgeous new ring! I cried, people cheered (they thought he proposed!) and it was the most romantic night. Every time I walk in the bathroom, I smile and remember that amazing night in the most fabulous place. (Go! You can thank me later.) Above the toilet is one of my favorite art pieces! It’s from @alexishunterinteriors and makes a very modern statement in a very old house. It’s the perfect oversized surprise in the small water closet. Guest bathrooms are such a luxury! We’ve lived in houses where guest were forced to use the kids bathroom, step over the small stool and gaze at all the Polly Pockets and play dishes in the bathtub and wonder “how do kids fit in there?”.